Challenged Sailors volunteers Bob Dillon, left, and Doug Shaw use the dockside hoist to assist participant Sue Taetzsch to board her boat as her sailing companion Joe Halsted stands by on the dock. Recently I was privileged to spend a Friday afternoon sailing with Challenged Sailors, the San Diego organization providing adaptive sailing opportunities to the disabled, as sailors prepared for their spring regatta. Challenged Sailors owns eight Martin 16s sailboats specially designed and equipped for the disabled. Watching the happiness and elation on participants’ faces as they readied their boats to practice their racing skills gave me the warm and fuzzies. I immediately understood the satisfaction Challenged Sailors volunteer Daryl Clark described deriving from assisting the disabled enjoy the freedom of sailing their own boats. Challenged Sailors is clearly in the business of bringing joy, freedom and a sense of control to people who’ve lost control over many aspects of their lives. Program participants have a range of disabilities. Some are blind, deaf or autistic. Some suffer from degenerative illnesses, while others are amputees, cancer or spinal cord injury survivors, or veterans with PTSD or severe injuries. Challenged Sailors has provided sailing opportunities to hundreds of the disabled and are seeking more recruits, especially veterans, for their programs. The only requirement is to be medically stable. With volunteer support, even quadriplegics can control and sail their own boats. “We have a power-assisted system enabling people with very limited mobility, even with no motion in their arms and hands, to use a mouthpiece with two straws — ‘sip and puff’ controls — to sail the boat themselves, with a volunteer aboard for assistance,” explained Doug Shaw. Challenged Sailors is a relatively new nonprofit, having taken over the adaptive sailing program from Challenged America. The organization has about 30 volunteers who return week after week because, they told me, they find such reward in helping others regain a measure of independence on the water. 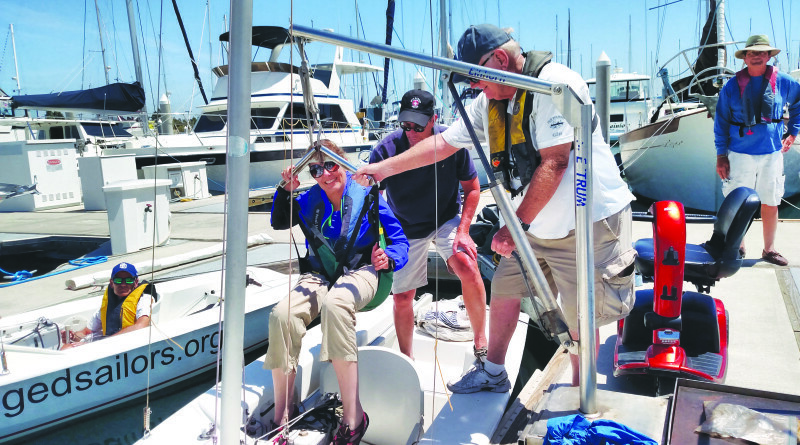 Many involved with the all-volunteer group, like founding members Sylvia Bate, Mike Swall and Shaw, have helped with the adaptive sailing program for years and moved over to the new organization. Many are Coast Guard-licensed captains or certified sailing instructors, while others are long-time sailors, experienced boaters or former commercial fishermen who teach newcomers how to sail and provide other program support. Some participants are long-time sailors whose disability had stolen their avocation and who can now sail again, accompanied by volunteer companions offering aid as needed. Some participants also serve on the group’s board of directors and help manage the program. During my visit I watched as volunteers Shaw and Bob Dillon assisted Sue Taetzsch, who uses a scooter, onto her boat, employing a dockside hoist. Soon Taetzsch and fellow participant Eric Brand, accompanied by volunteers Joe Halsted, a licensed captain, and Jane Dunn, a certified sailing instructor, sailed into the bay, handling their boats expertly, tacking to alter course and later to return to their home dock. They steered their two-person boats with a joystick and adjusted the mainsail and jib with easily pulled and released lines. Both have limited mobility, but you wouldn’t know it from their boat-handling skills. Taetzsch, who is also hearing impaired, developed special hand-signals to communicate with Halsted during the regatta. Challenged Sailors’ skilled sailors make the Martin 16s fly across the San Diego Bay waves most Friday and Saturday afternoons, crisscrossing the bay from Harbor Island to Coronado and toward the Embarcadero. If you know someone who would benefit from CS programs or if you’d like to volunteer, sign up through their website at challengedsailors.org or call 619-764-1604. It may change your life.